The small road in front of my house is a peculiar one. Or more accurately, it guides peculiar traffic. During the summer months, I’m as likely to hear the clip-clop of horses’ hooves pulling carts as the noise of a passing car. Periodically there is the tell-tale roar of a passing bus. Some time ago I saw a man biking down the street and singing to his cow that he had along for the ride on a rope. Just the other day I saw it again: something that caught me completely off-guard. You would think that I’d expect just about anything by now after a full year in Chile, but that is giving me too much credit. I was amused to say the least when my bus had to slow down because of an obstacle in the road. I peered out the window to see what was causing the delay. 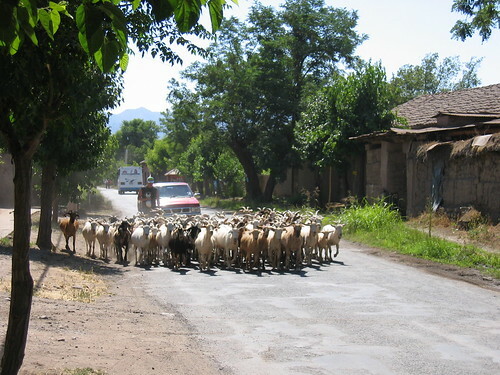 A man herding his goats. Of course. I can’t even fathom what I might see next on this sleepy little country road.